Nikon lens compatibility has been getting better on Sony cameras, but the new Vello Version 4 is the first to achieve close to native performance. In the video above many of the lenses score 4/5 for their AF performance, which is about where Metabones/Sigma adapters perform with Canon lenses. The new Vello is certainly a nice addition and I can’t wait for more users to test it on cameras like the Sony a9 even though it is not officially supported yet. Hopefully, Vello continues to improve their firmware and expand official support. It’s always good to have adapters like this to help photographers switch gradually. You can view the list of compatible lenses below or download the pdf here. It appears that Vello is being very honest about the performance of their adapter. The following Nikon lenses and Sony cameras have been tested with the Vello LAE-SE-NF lens adapter for photo compatibility, some with operational limitations. If a lens is not listed, it might not work properly. 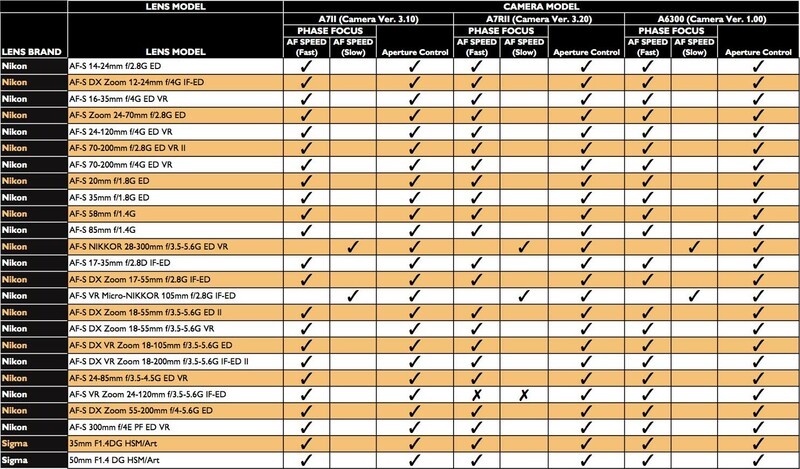 We’ll be testing more lenses and cameras and adding them to this table, so check back for future updates and firmware upgrades. Note: All lenses were tested in AF-S with center point focusing. This entry was posted in 3rd Party Lens, Accessories and tagged Vello, Vello LAE-SE-NFV4, Vello Nikon F. Bookmark the permalink. Trackbacks are closed, but you can post a comment.